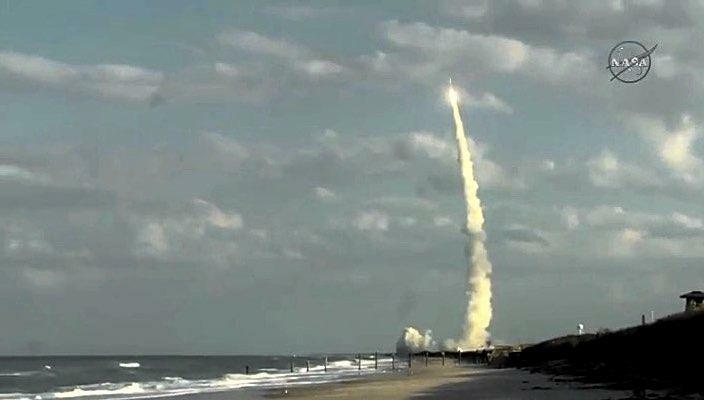 The second of four next-generation GOES weather satellites, the stars of an $11 billion program to upgrade America's weather observation and forecasting infrastructure, was boosted into space Thursday by a United Launch Alliance Atlas 5 rocket. The newest Geostationary Operational Environmental Satellite -- GOES-S -- lifted off from pad 41 at the Cape Canaveral Air Force Station at 5:02 p.m. EST (GMT-5), the opening of a two-hour window. The towering 197-foot-tall rocket's Russian-built RD-180 first stage engine and four strap-on solid-fuel boosters ignited with a rush of fire, quickly pushing the Atlas 5 away from pad 41 at the Cape Canaveral Air Force Station atop 3.2 million pounds of thrust. Arcing away to the east, the rocket put on a spectacular afternoon show for area residents and tourists, smoothly accelerating as it consumed its liquid oxygen and kerosene propellants and lost weight. The strap-on boosters were jettisoned just under two minutes into flight and the RD-180 shut down as planned two-and-a-half minutes later. The rocket's Centaur second stage, powered by a hydrogen-fueled Aerojet Rocketdyne RL10C engine, then took over, driving the spacecraft into space. Two more firings were needed over the next three hours to finish the job before the newest Geostationary Operational Environmental Satellite -- GOES-S -- could be released into an elliptical orbit with a high point of nearly 22,000 miles and a low point of 5,100 miles. An on-board thruster will be used to put the weather station into a circular orbit 22,300 miles above the equator. At that altitude, satellites take 24 hours to complete one orbit and appear stationary in the sky. The National Oceanic and Atmospheric Administration, or NOAA, positions its GOES weather stations for views of the eastern, central and western United States, providing hemispheric coverage. GOES-16, originally GOES-R, is positioned above the equator at 75 degrees west longitude -- the GOES-East slot -- and covers the Eastern United States and the Atlantic Ocean all the way to western Africa. GOES-S will be renamed GOES-17 after tests and checkout. It then will be maneuvered into the GOES-West position 22,300 miles above the equator at 137 degrees west longitude. From there, it will provide fast, multi-spectral images of weather patterns affecting the Pacific Ocean as far west as New Zealand, including Hawaii, Alaska, Mexico, Central America and, of course, the western United States. "The new satellite will augment observations over the Pacific Ocean and around mountain ranges where radar coverage is limited or blocked," said Joe Pica, a National Weather Service manager. "Marine forecasts will improve with GOES-S high-resolution imagery as we see features in the atmosphere and ocean that previous instruments did not allow. Combining these images with rapid updates every 30 seconds will help us predict storm systems more accurately and in real time." Together, the new satellites represent "a quantum leap" above previous space-based weather stations, forecasters say. "Coupled with the use of our (Japanese) partners' advanced Himawari satellite, we are able to cover more than half of the planet with the most sophisticated weather forecast technology and observations ever flown in space," said Stephen Volz, director for satellite and information services at NOAA. GOES-16 proved its value during a dramatic hurricane season in 2017, "proving to be a game-changer with much more refined, higher quality data for faster, more accurate weather forecasts, warnings and alerts," Volz said. And that translates into lives saved. NOAA is spending $11 billion to buy the GOES-R, S, T and U satellites, their rockets and launch services, along with major upgrades to ground systems and data analysis infrastructure. Each satellite is valued at around $500 million, not counting development costs. The new satellites, known collectively as the GOES-R series, will be phased in over several years, taking over from three older-generation GOES spacecraft currently in orbit. GOES-T is expected to launch in the 2020 timeframe and GOES-U will follow suit around 2024. Built by Lockheed Martin Space Systems, the new GOES satellites feature an advanced high-resolution camera, a sensitive magnetometer, an ultraviolet X-ray sensor to measure solar radiation, an ultraviolet imager to constantly monitor the sun and sensors to measure charged particles from the sun that can affect communications and navigation. The satellite also is equipped with a lightning mapper that can snap photos of lightning fields in the western hemisphere about 200 times a second. "When it ... becomes operational later this year, GOES-S will see the west in true high-definition, and along with the remaining satellites in our GOES-R series, will extend the life of NOAA's geostationary satellite constellation through 2036," said Tim Walsh, acting director of NOAA's GOES-R program. "These satellites are giving us the ability to look at storms as often as every 30 seconds, allowing forecasters to see storms as they're developing instead of as they've already happened."